Its been a busy week here for Rambling Renovators! Its the Toronto International Design Festival which means all the biggest and best events in design are happening this week. The week culminates with the Interior Design Show which opened last night with quite the gala event. 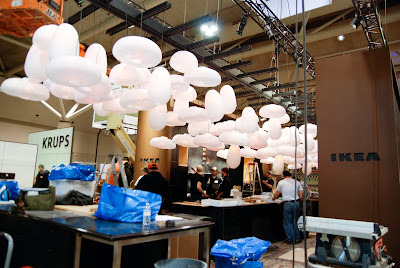 Along with a few other bloggers and media, I had the privilege of seeing the IDS show floor a mere 24 hours before opening night. We started off our tour all smiles in our dorky hardhats. (Notice the always stylish Arren Williams in his orange Hermes helmet). That's Shauny Levy, director of the Interior Design Show beside Arren, who conducted the tour. We got a peek at the Sarah Richardson designed Panton chair that was going up for auction last night. 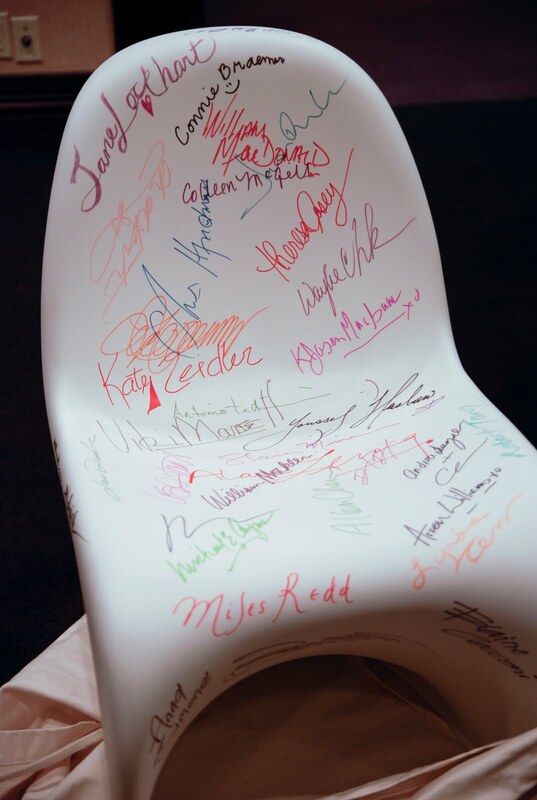 Sarah had the chair shuttled around the city to get it signed by many celebrity personalities. 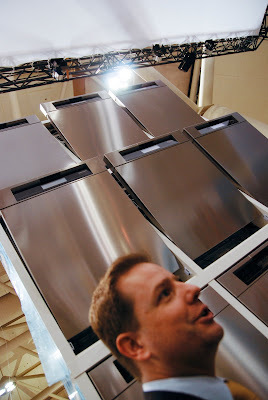 Then we headed to the show floor - and let me tell you, it was pure chaos! I didn't know if they were going to pull it off. 76,000 hours + 9000 cups of coffee + 3000 steel toe boots + 1200 gallons of paint + 3 football fields of storage + 56 people laying carpet by hand. Those are just some of the numbers behind putting an event of this magnitude together. 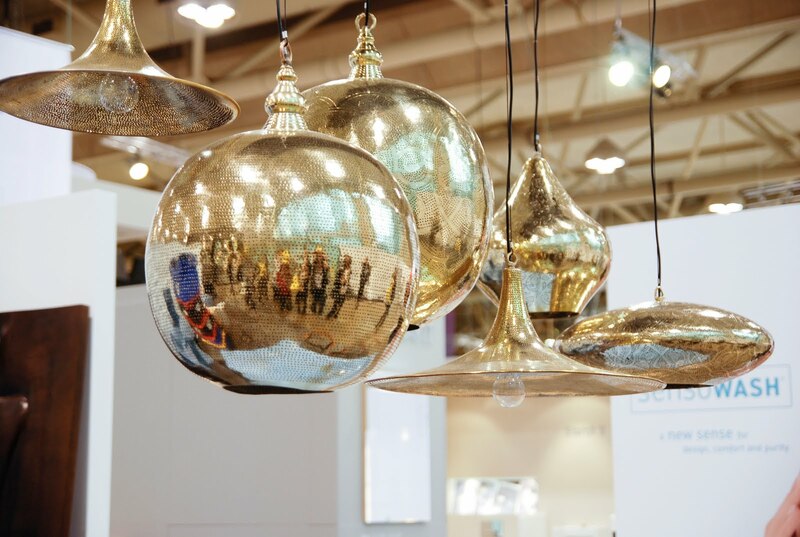 We saw some beautiful installations in progress, like these stunning brass pendants at the Snob booth and the always inspiring lighting at Ikea. 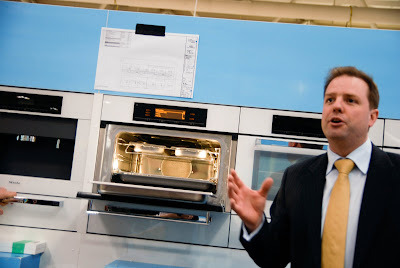 The Miele folks showed off their new dishwashers which feature an auto-open feature that helps to dry the dishes, and their new multi-function steam convection oven. The ovens are in this shiny white exterior - apparently, shiny white kitchens are all the rage in Europe and are making their way here. 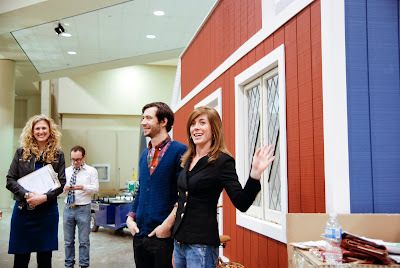 The highlight of the tour was the Sibling Revelry spaces created by pairs of designery siblings. Glenn Dixon and his fashion designer brother David were inspired by the book "Sadaku and the 1000 paper cranes" and created a dreamy space. I loved all the moulding and trimwork, which for a temporary installation was quite well done. 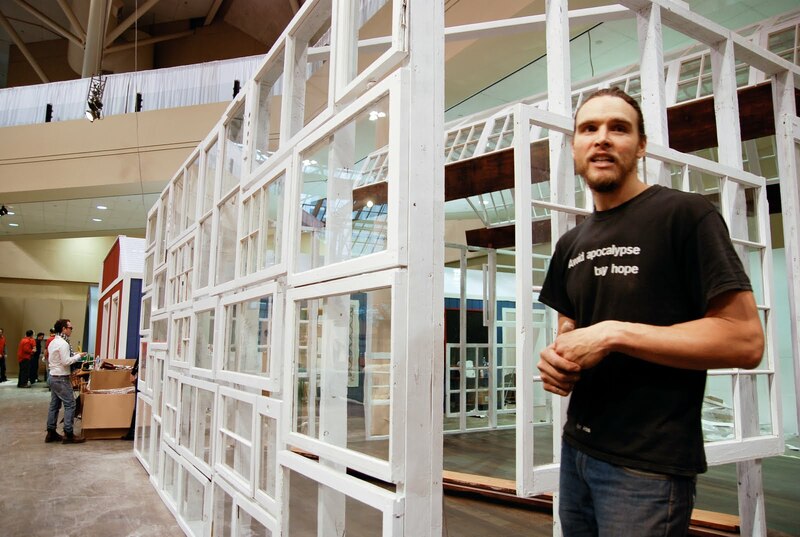 The Brothers Dressler created a giant room of glass. The exterior was made from reclaimed windows, all of which would be reused in other projects after the show. And then of course, there was the spectacular space created by Sarah Richardson and her brother Theo. It was a standout. 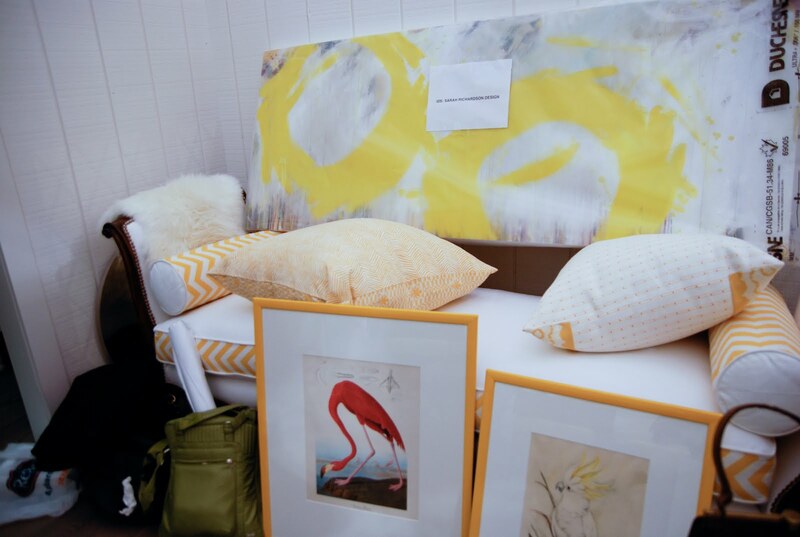 Each room was designed to showcase a product made by Theo, a partner in design studio Rich Brilliant Willing. 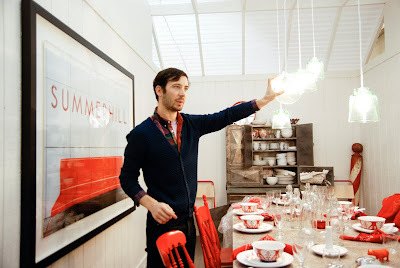 My favourites were the In The Right Light pendant lights and the Appalachian Chair featured in the dining room. Evocative of rowdy family gatherings around the dining table, the room blended modern and vintage features. 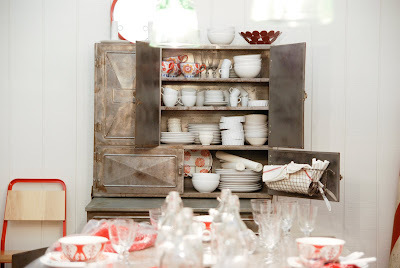 I loved the brushed metal cupboard, the striking subway art, the Ikea dishes and bottles, and the mixed chairs all painted in the same warm cherry red. At the gala last night, I was able to see how it all came together. I posted a few pics on my facebook page but do encourage you to come to the Interior Design Show this weekend and see for yourself! Looks like such a great show, and so cool that you got to have a preview! 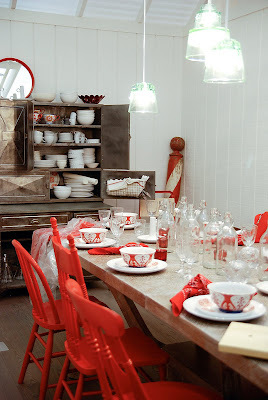 I am in love with the mismatched chairs all painted red! 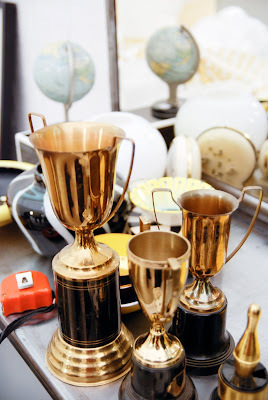 I will be saving this photo in my inspiration folder for garage sale season! 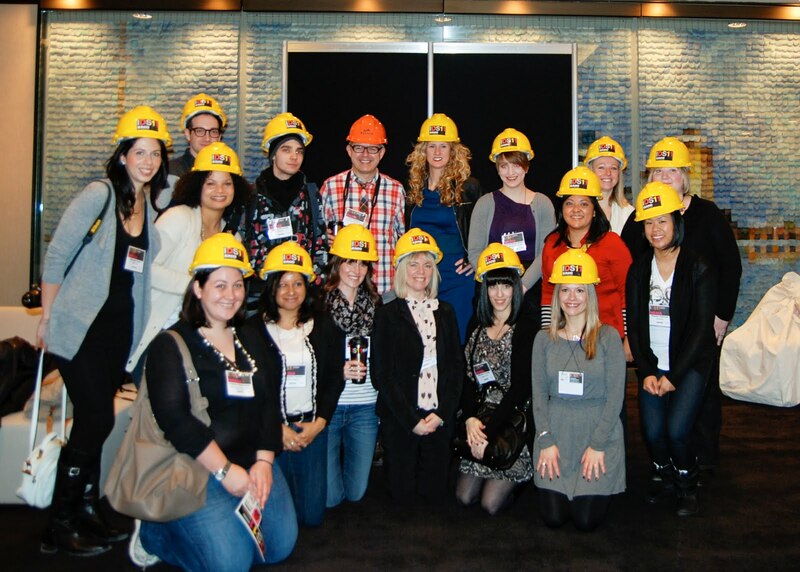 I love that pic of you all in your cute hard hats!! Great preview, it's amazing all the work that goes into it (and that they had it all ready in time!). Fabulous post Jennifer- loved that you inlcuded those stats and those snob lights are so good!!! Those brass installations are stunning! Thanks for sharing!! love the show and I have to say I love the rooms done by Sarah and Glenn. Glenn's room is so lux and the cranes.. what else can i say! Sarah's rooms look amazing and how all the other designers turned their spaces into one big open concept space but sarahs was divided up into 3 but they really live large!! I love the table designed by Theo turned pendent in the yellow room and the fun and punchy red end chairs in the dinning room! too bad I didn't get to meet you today Jenn! What a treat. We on the west are jealous! It was fun to meet up last night - and meet the Handyman. I had a blast at the event.